LEGO® is not being taken seriously by workshop attendees: Every product building simulation based on LEGO® I have been participating in so far ended up in a frantic race against the time-box. In the end, anything “created” was accepted, no sprint ever failed. Value? No one cared. Planning? Hey, there is none—as we all know—planning in Agile, right? LEGO® is not trust building: Imagine the following conversation happening after a 2-day-workshop: “Boss: What did you learn at the workshop? 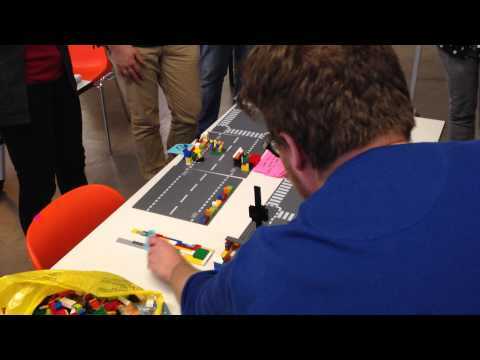 Participant: We build an airport with LEGO®. Boss: At $ 1,500 expenses—tell me, what's in for the company?”. All those issues are the reason, that the workshop Agile Software Development, my friend Martin Rothenberger and me will be organizing on October 22, 2015 in Berlin, will not use LEGO®. Instead, we will be building a simple, yet clickable and hence user-test ready prototype of an app with Marvel, one of the most advanced prototyping tools. Lego worked for me. Over the past 3 years, I’ve used Legos to introduce agile to thousands. I have had the opportunity to watch them progress. Some have failed many have succeeded; but all started with Legos. The Legos introduced basic concepts and generated excitement. They broke resistance. The first hour of most workshops is a one hour scrum immersion. It is very fast and generates a lot of excitement. In the first 5 minutes everyone builds a lot without any thought of the product owner. They all fail at this point and we introduce the a helper. They lead scrum for two 20 minute sprints. Later, when everyone catches their breath, we tell them what they learned. The Legos are only used for an hour, so, not quite as expensive as two days. The remaining workshop varies hands on work, penny games, pizza Kanban, videos, and stories from similar teams. These workshops are 1/2 day to one day. All teams volunteer for the workshops as we have an opt-in transformation. The demand for Legos was slow at first; but gained as the reputation of success spread. After a year and a half, our CIO pulled us into her office to congratulate our four person team on transforming the organization. She was amused with the stories of Legos she heard about. The workshops were whole team and often involved senior leadership, the business, as well as all teams. Even our SVP’s played with Legos and loved it. Our CIO related that her leadership said good things about the Lego workshops. We’re on our last 10% of the org. That’s about 700 folks in a few areas that didn’t volunteer until this year. So, after nearly 6000 people have played with Legos and succeeded in changing mindset and behavior, I’d recommend Legos as a tool. They are not the only tool; but they do help. I wouldn’t recoomed more than an hour and a half of Legos; but I wouldn’t run a workshop without changing media and engagement modes every 30 to 90 minutes. We swap play and traditional learning modes constantly. Adults can’t play for too long and they can’t sit in front of PowerPoint too long. Perhaps the issue is not in the Legos; but in how they are used. For me, Legos are not a fad. They are a must and I can’t imagine not using them for many types of training. Cultures and companies may vary, so, perhaps they don’t work for every situation. Still, I think the issue is not likely to be Lego as a learning tool. Rather, the issue may be in the application of Legos. @KoenV – I put my hypothesis, that you can build “software” using rapid prototyping tools in entry-level workshops, to the test last week at my current client. It was a 3 hour workshop and the half of the participants didn’t have any background in software design whatsoever. I tasked them with designing the basics of an app to support with the organizing of team events. We started with approx. one hour spent on identifying a probably customer journey and its basic features using a light version of Jeff Patton’s user story mapping. Once we agreed on two “versions”, we split the group into two teams. We demoed Marvel and then started the first sprint, well we did not label it that way. b) a much better understanding how product management & engineering in an agile set-up actually works. So, from my perspective, it is worth giving it a try. Up to some extend I can agree with the fact that people question the added value of building airports… Software professionals can have a “binary” mindset and their management can have their doubts about the added value of paying 1500 USD for playing with LEGO during 2 days. On the other hand, you do have a team dynamism going on: people working together making something. How will you achieve this team dynamism using a prototyping tool? Is it a matter of each participant preparing part of a flow and then integrating it as team? Additionally, it is always better to learn in a safe environment. Building stuff with LEGO is definitely a safe environment. Isn’t it a potential pitfall that people will use their own case to work on (with too high expectations) and possibly be disappointed about the result, or focus more on the end result and less on the learning part?